Sleek and ultra-slim, this tricky little liquor smuggler stows discreetly in a back pocket, desk drawer or dinner jacket and accommodates three ounces. Engraved with two initials of your choosing, this is a keepsake they'll treasure and use time and again. One Slim Engraved Stainless Steel Flask. Two initials engraved on flask surface. Enter information to be engraved during the checkout phase of the ordering process. 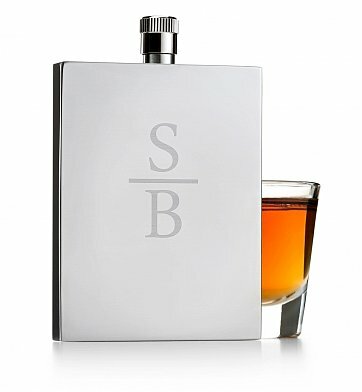 Engraved Keepsake Metal Flask is a hand delivered gift. These gifts are delivered by one of our local design centers located throughout the United States and Canada. Same day delivery is available for most gifts when ordered before the cutoff time. The cutoff time for Engraved Keepsake Metal Flask is 2 PM in the recipient's time zone.